This ones a little messy, but you get the idea! Just a spur of the moment idea by a cheap-assed grandma! Hahahahaha! Now for the fun part! Adding Frozen characters!!! Slowly, but surely I will get them all done! It's a lot of fun, when time permits! 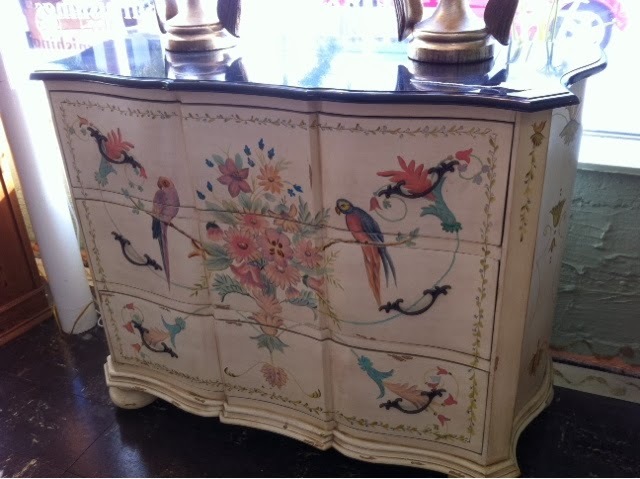 I was loving this sweet marble topped hand painted chest. But 385 dollars....steep, but I'm sure, well worth it. I could not fit it into my house! It was pretty much love at first sight! Have a great week everyone! 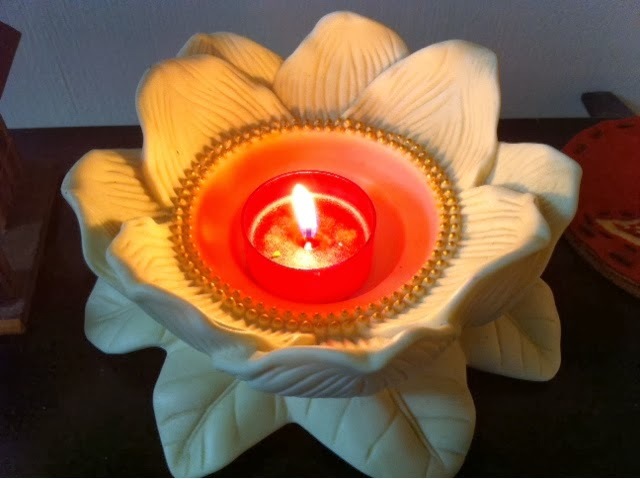 Pray for my husband and DIL who have colds! I'm staying up on the Vitamin Water and Emergen-C!!! 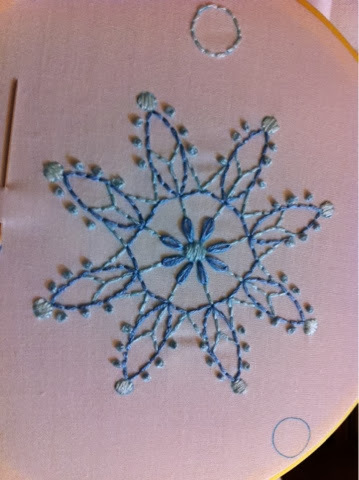 Snowflake #2 out of 6 embroidered! 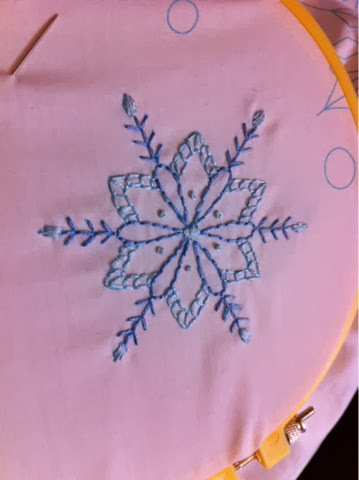 It is a slow process, but continuing the Dimensions snowflake pillowcase I am embroidering for my 5 year old granddaughter, princess Emily.....a labor of love, for sure!!!!! 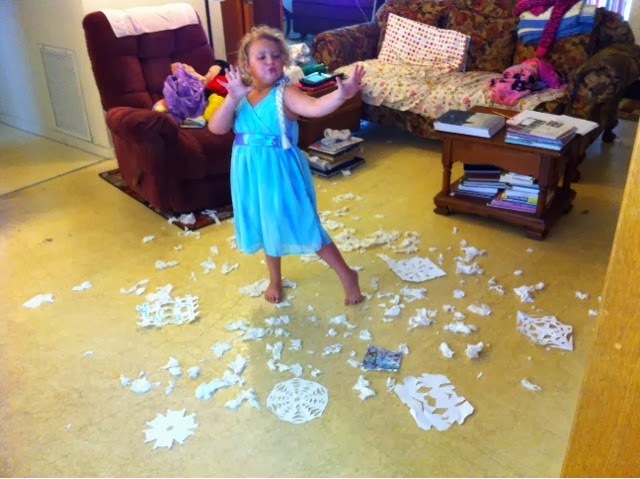 Elsa dancing in snow, and a fun way to entertain a 5 year old for hours!!! 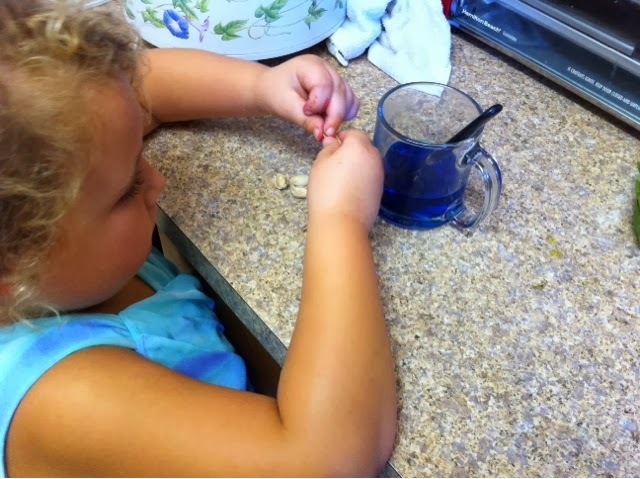 One of her new found loves is cracking open and eating pistachios. 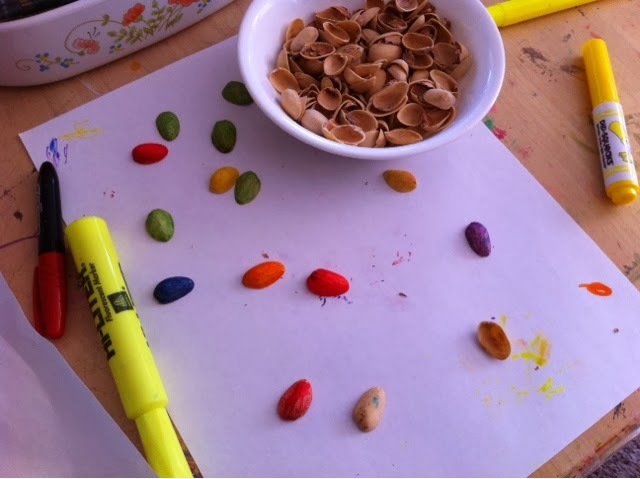 We decided to color the shells with markers to use in an art craft. Soon, we decided to try dying bigger batches. Used food coloring in water with a splash of vinegar. The neon blue came out the prettiest (a nice sort of teal). 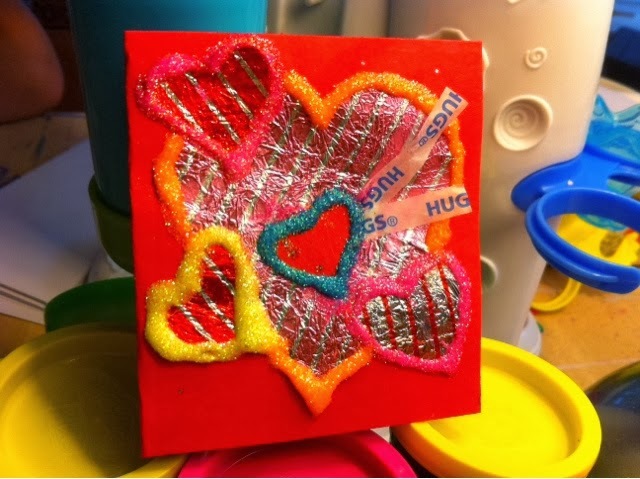 The whole time we worked on it, the 5 year old sugar girl kept on saying, "this is the most awesome art craft, isn't it Grandma"?????? Lol. So cute. This activity kept her entertained a couple of hours! WOWZERS! Any good ideas on what we could do with these babies? 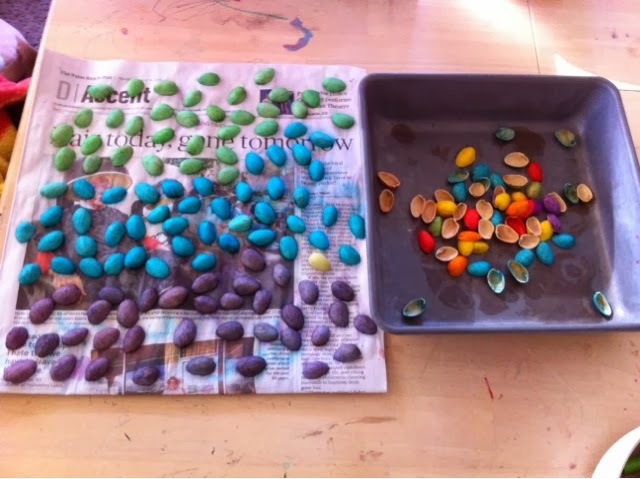 We left some natural color too! I was thinking of hot gluing a wreath or a sign saying "Happy Birthday", maybe????? 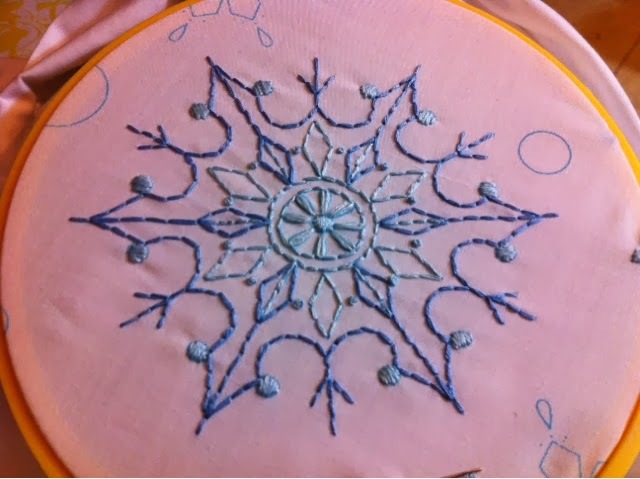 Here is the Dimensions pillowcase embroidery I am currently working on. There are 2 pillowcases, and I am happy that my dear DIL has agreed to embroider the other one! They are being done because my grandkids LOVE the movie Frozen. 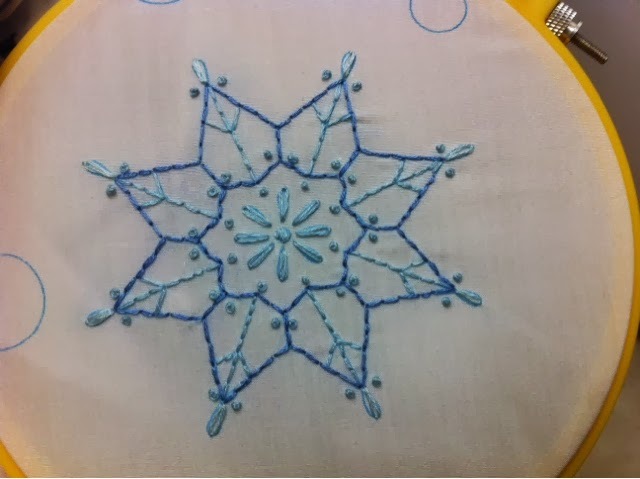 We are planning to finish the snowflakes patterns (stamped), and then add embroideries of the movies' characters! Thank God she is going to help! Yeah! 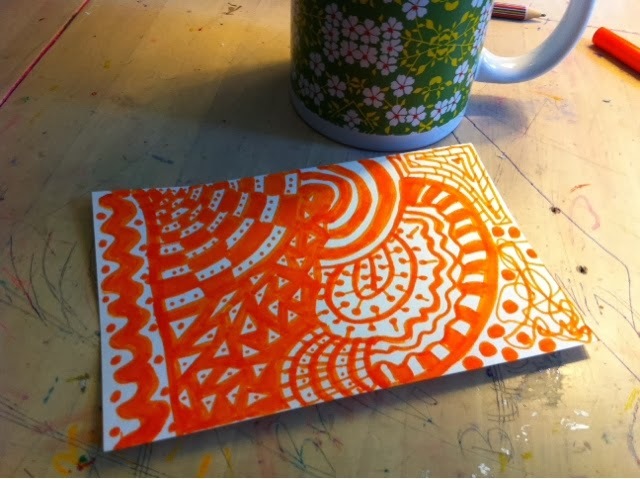 You know it's a sunny day when Julie and Emmie (5 year old granddaughter) are making ORANGE zen tangles!!!!! Good Friday morning! We woke up to 54 degrees here, and man, does it ever feel fresh and wonderful! I went out to water in my Capri pants and thin cotton summer shirt because it was in the 80's yesterday, and got a pleasant surprise! It was chilly! I felt myself dreaming of sitting by a fire drinking a mug of warm soup! Lol. 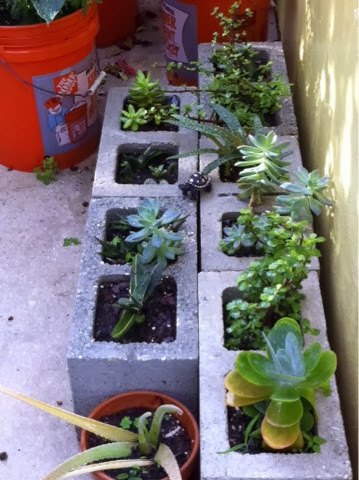 Well, my little succulent garden out back in the cinderblocks is doing great! They all look so happy and are really thriving and growing in! That worked out well. If you are thinking of trying this, I just want to tell you that I lose NO soil out the bottom of the blocks! I couldn't think of any way to hold the soil in but it seriously has not been an issue. Yeah! 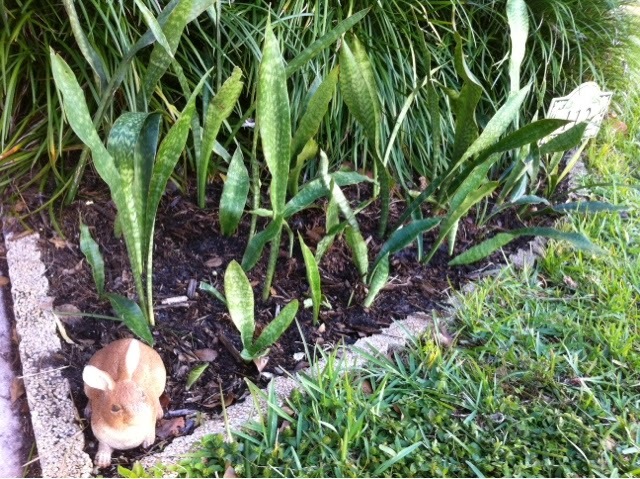 I can see expansion of this little garden in the future! It is perfect for succulents in south Florida, as ours are tiny as compared to specimens on the west coast! (Jealous)!!!! 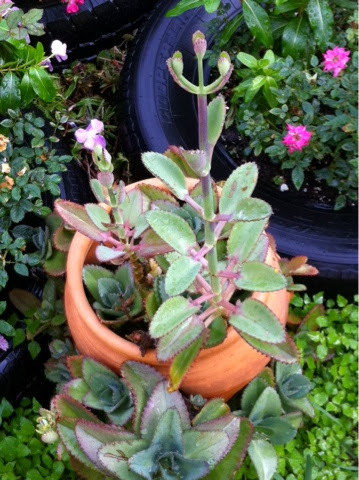 My beautiful kalanchoes is starting it's yearly climb upward to make its bell shaped blooms! Always exciting to watch! 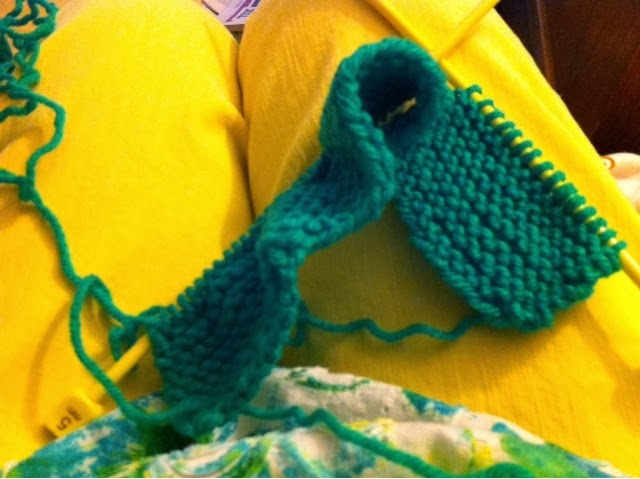 Here is how far I've gotten on my knitting of the rectangle for Warm Up America. So far, no mistakes, thank God! At least not that I know of! It is a sort of hideous green, especially against my yellow pants, but I am thinking of toning it down with a floral cross stitch pattern and the word LOVE in the middle before I turn it in! I think that way it could be incorporated into a bolder aphgan. 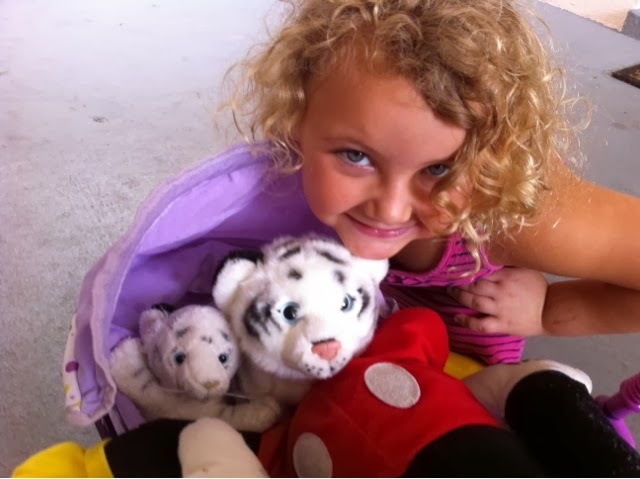 Emmie got a new momma striped kitty cat for her baby and is in hog heaven! 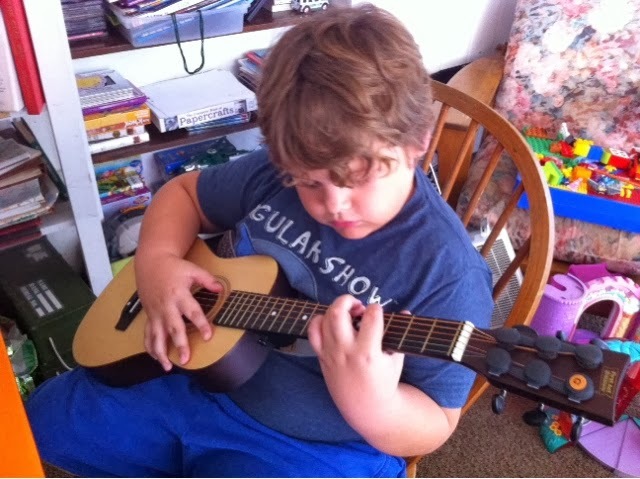 Donovan got a new guitar and is taking online lessons just for kids and is learning quickly and LOVES it! Grandma Julie is so proud of him! He plays the bass at school and the year prior, the violin. He seems to have an affinity for the strings! 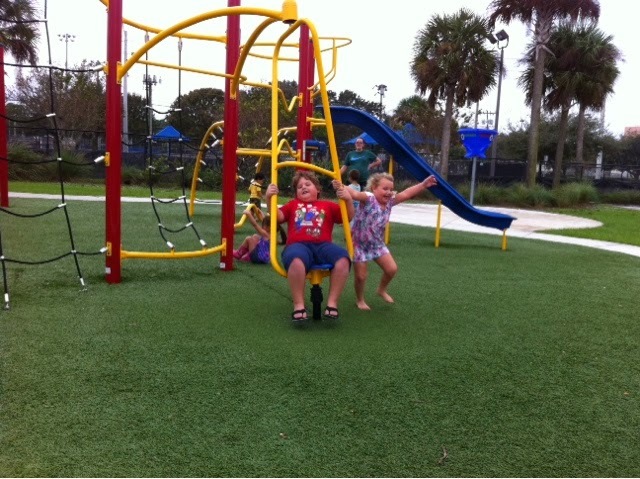 Here are the 2 wild kids at the park. They both love the "spinny-thingy" that Donovan is sitting on! They both got new scooters for Christmas too, and their exercise levels have increased 500%! Yeah! Evil grandmas plan is working!!!!! Lol. Emmie loves Elsa, one of the sisters in the new movie, Frozen. My daughter gave Emmie cat eyes and purple eye shadow just like Elsa's. Big stuff, I tell ya! 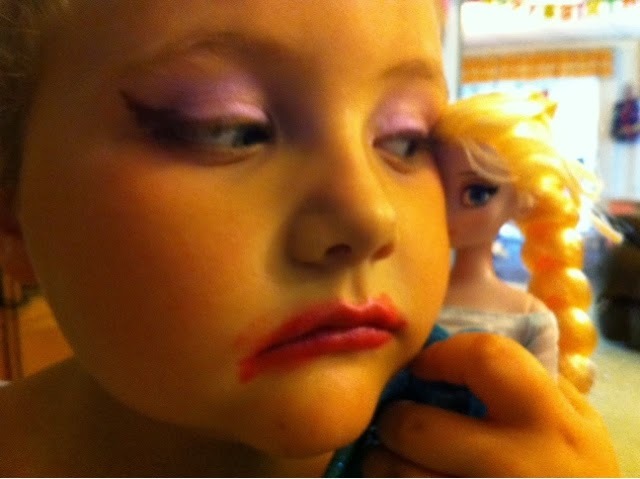 The lipstick was applied by she, herself! Whoo-hoo!!!! She also has an app to record your gratitude lists and photos, for your IPAD and IPHONE. Not sure about other phones, but check it out! TGIF! Have a great weekend everyone!!! !